If you’d like to help the shelter dogs and cats, but can’t get to Plant Road, you may want to consider fostering. 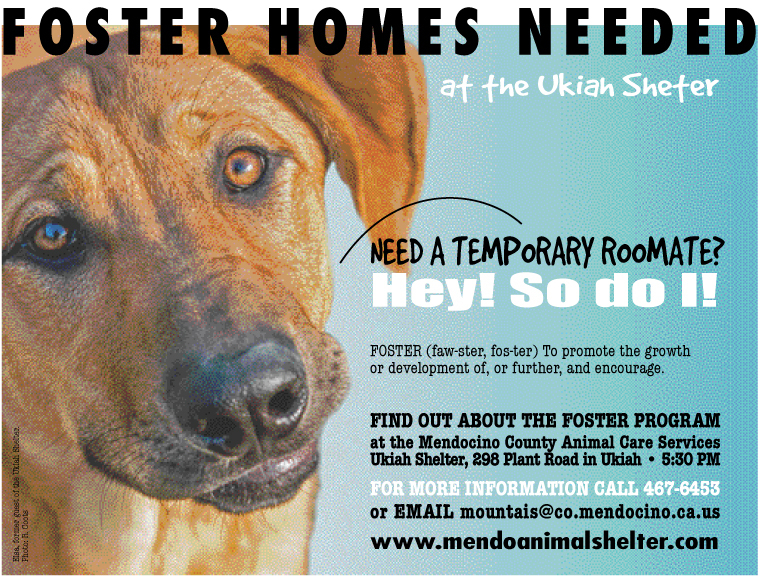 The FOSTER PROGRAM at the Ukiah Shelter is a great way to help dogs and cats--from your own home! We are always looking for temporary homes in the inland Mendocino County area. A foster family provides a safe environment for a shelter guest. Another great feature of the program is the information foster homes provide about their guests–information that is very useful as we search for the right adoption and home for each animal. If you would like to foster a dog for a short period, our PAJAMA PARTY program might be the ticket for you! Pajama parties are one-or-two-night stays in your home. While you are fostering a dog or cat, the shelter provides support, along with food, crates and bedding, if requested. Any necessary vet care, including vaccines, are provided by the shelter. The foster family provides a safe environment for their shelter guest. If you rent your house, your landlord must provide written approval for a foster placement. Shelter staff will need to approve your request to foster If there are any other pets in your house, and all pets in your home should be up-to-date on their vaccines. As a dog and cat foster family, you must agree to return your shelter guest when requested by shelter staff for needed medical care such as vaccines. The Ukiah Shelter Foster and PJ Party programs are wonderful opportunities to help out a great dog or cat--it’s a win-win situation! 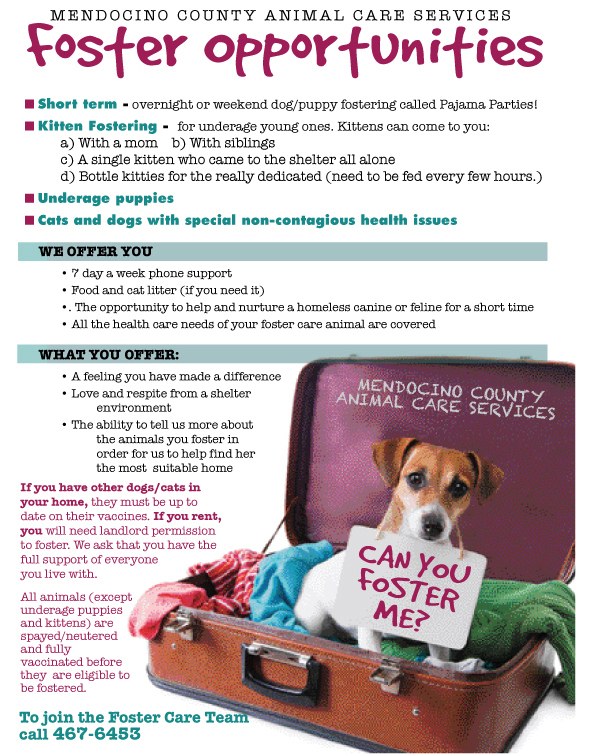 What you learn and observe during fostering and PJ parties can assist a dog or cat find a good match in his or her forever home. If you might be interested in welcoming a shelter dog, puppy or kitten into your home as a foster, please contact Sage for more information.